There is only one breathe training device that Steven Mead uses every day, and it is the ULTRABREATHE. This small item will become an essential part of your musical equipment. Use it twice a day and the muscles around the lungs become stronger and more flexible. Steve Mead says, "I've been using the Ultrabreathe for over 10 years now and have noticed a large improvement in the quantity and quality of air I'm able to use. I was a little scepticle of breathing devices in the past and did buy a few which now collect dust on a shelf somewhere, but the ultrabreathe is quite superb. I think it was developed initially for the medical professional to help people with air 'disorders', asthma etc and has been used by young and old alike and in more recent times by athletes in training and in the last couple of years , by brass and wind musicians. To date I have never met anyone who used it and did not feel an almost immediate benefit from it." Steve on his routine: "I use it early morning for about 3 minutes, then a minute or so before I play, and sometimes in the interval in the middle of a concert. It keeps my air supply in the highest condition...it actually reduces stress levels and makes you feel better. Sometimes while driving too, although having the ultrabreathe in the mouth can cause a few glances when you have to stop the car...oh well!! 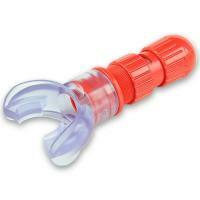 It is a resistance inhaler with varying levels of resistance so you can start gently and build up. I try to inhale my full lung capacity in about 3 seconds then exhale , depending the exhalation setting in about 2 seconds. If the exhalation setting is set at maximum resistance you can try to exhale for up to 6 or 8 seconds. Repeat the process about 20 times and thats it, you're done, ready to play...until you feel you need it again. Use it every day and you'll notice a positive improvement with your playing within a week. Don't just take my word for it...try it."